This is the first undergraduate textbook to provide a comprehensive overview of essential knowledge, skill, and attitudes about safety in nursing practice. 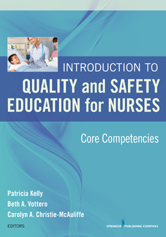 It reflects the six areas of nursing competencies as developed by the Quality and Safety Education Program for Nurses (QSEN) initiative, which are currently required content in undergraduate nursing programs. Using an inter-professional focus, the book addresses the fundamental knowledge required of entry-level nurses in each of the six QSEN areas: quality improvement, patient safety, teamwork and collaboration, evidence-based practice, informatics, and patient-centered care.